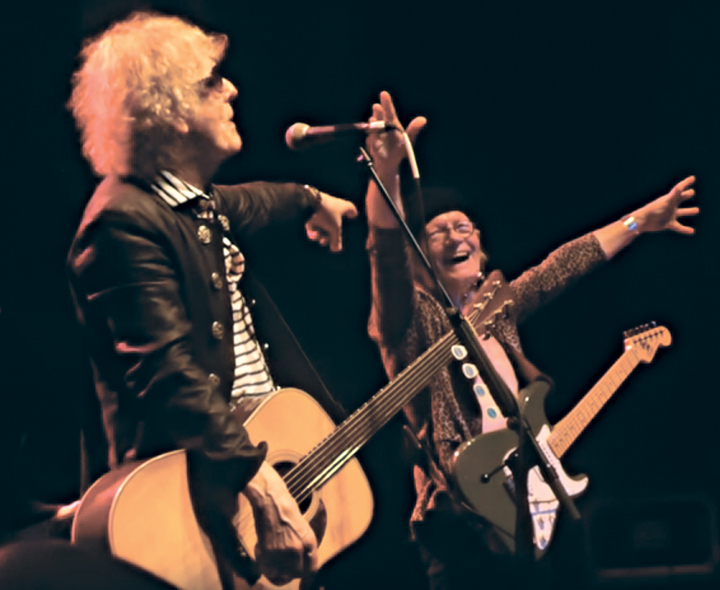 Philly has always been a Mott town — and a Bowie town, and even a Roxy town — so the reunited Mott the Hoople ’74 easily had fans at the Keswick Theatre in nearby Glenside, Pa., in a prolonged state of virtual rapture. Deservedly so. 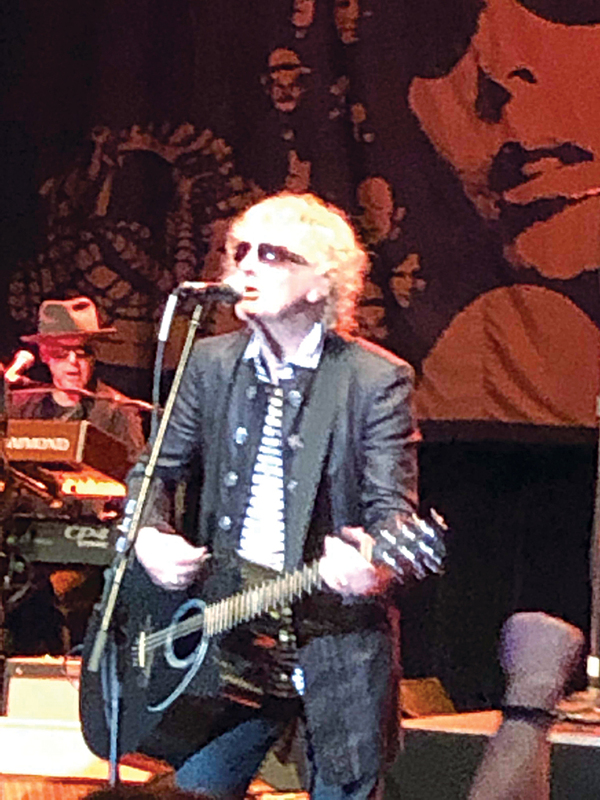 The band was hot, and its three chief reunitees — singer-guitarist Ian Hunter, 79, guitarist Ariel Bender, 72, and pianist Morgan Fisher, 69 — came through like rock stars. Well, they are rock stars. But for Bender and Fisher, Mott’s quickie eight-show U.S. tour offered the chance to reclaim that lofty title. (This is apart from Hunter, who, post-Mott, enjoyed remarkable solo success, and has been gigging in the States all along.) You sensed the sheer fun Bender and Fisher were having, and it was contagious. Above, Hunter sings and strums in a photo by my buddy of 47 years, Mad Jack drummer David Arlen Sendrow. 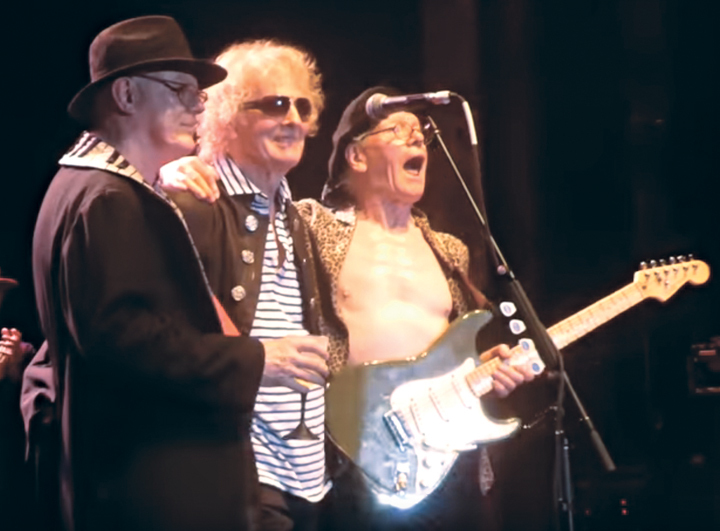 Backed by Hunter’s solo group, the Rant Band, Mott also performed “Lounge Lizard” (a Hunter solo song which worked like a charm), “Alice,” “Honaloochie Boogie,” “Rest in Peace” (with Fisher’s flawless Bach intro), “I Wish I Was Your Mother,” “Pearl ‘n’ Roy (England),” “Sweet Jane” (a cover from a Mott album produced by David Bowie), “Sucker,” “Rose” (just a gorgeous rendition of a heartbreaker of a song), “Walking With a Mountain” (with Bender recreating his traditional loud, raunchy intro), “Roll Away the Stone” (with sublimely played opening riffs from Bender and Rant Band guitarist Mark Bosch), “Marionette” (an epic) and, just prior to the encore, a hard-driving medley (patterned after one on the live album). A triple-threat all evening was Rant Bander James Mastro, who played sax, mandolin and guitar. Above is David’s photo of Ariel Bender rocking out. Bender was a moving target all night, posing, pointing and mugging. It’s no secret to fans that playing-wise, he will whiff on occasion. Still, if you keep an ear trained to what he’s doing, you are constantly rewarded. Bender is a surprising player. He’ll play something from 1974, or something you’ve never heard before. 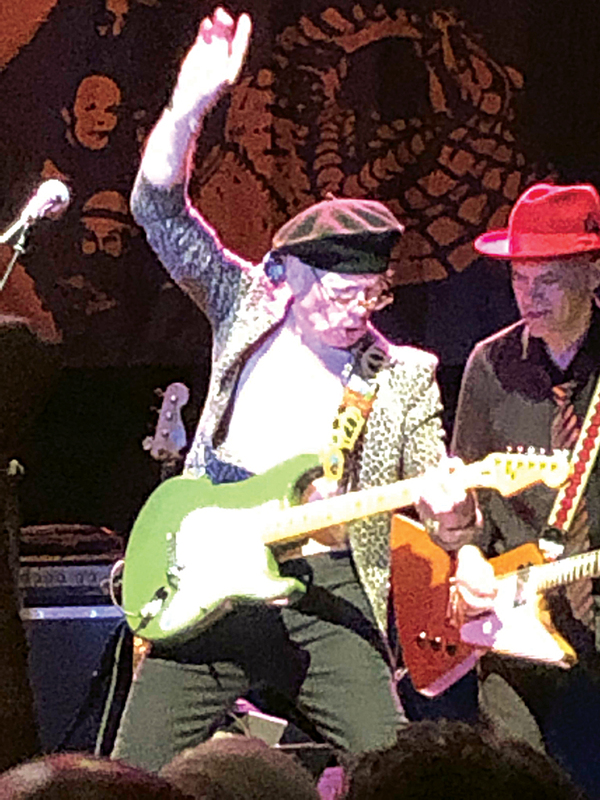 He worked that moss-green Strat, pulling his poor strings to the edge of their breaking points … working the whammy bar in a blurred fury … sometimes playing with a pick, sometimes plucking harmonies with his fingertips. And he’s always a sight. 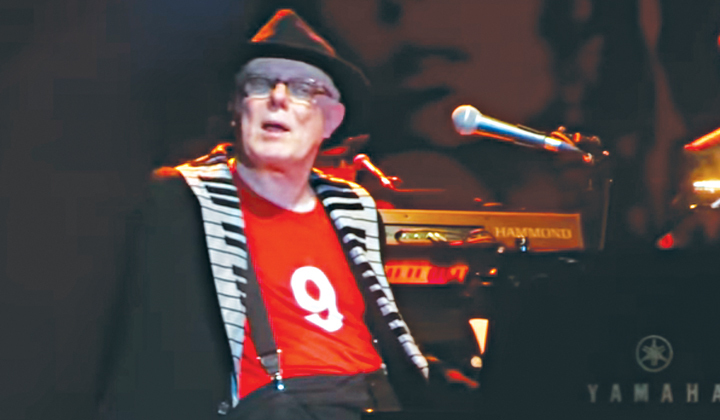 At the Keswick, Bender wore a black beret; a shawl-like garment (which gave him trouble, so he ditched it early); a leopard-print jacket over a bare chest (he has the kind of physique you usually see poolside at a retirement community); black “skinny” pants; and black shoes with big, bright-red buckles (the kind you usually see on pilgrim hats). I forgot to mention the big bow securing a ponytail at the back of his neck! Twice, Bender recycled John Lennon‘s “Let It Be” line about “passing the audition.” He even did the “It’s great to be here … it’s great to be anywhere” line. Fittingly, Bender did the maniacal laugh during “Marionette.” The guy’s an entertainer. Even Fisher did some clowning. 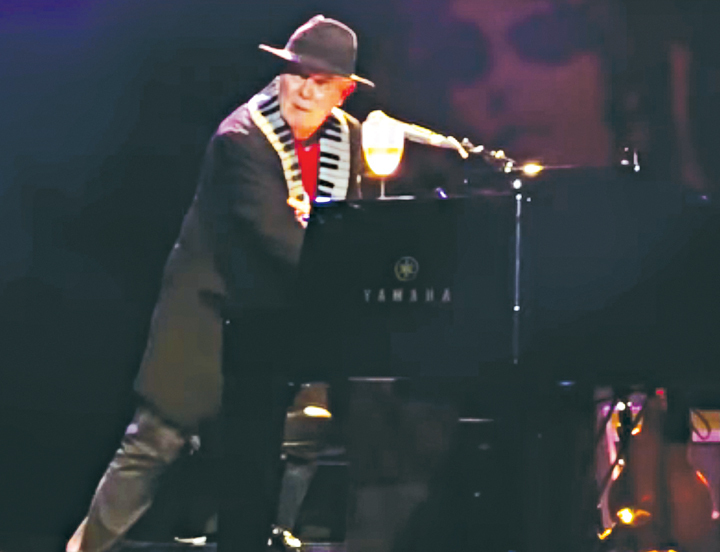 Clad in his black, wide-brimmed hat and piano-key lapels, he often toasted the audience with a glass of some libation he kept on his piano. (You could call this Fisher’s version of Liberace‘s candelabra.) Later in the show, he began “All the Way From Memphis” by performing a broad pantomime in which he pretended to search for the correct notes. Fisher? Searching for notes? The guy who plays Bach’s “Prelude #1 in C Major” without so much as glancing at his keys? The audience was made up of mostly 50- and 60-somethings who generally remained seated. But Mott was a wild band in the old days, and its audiences could get rowdy. Maybe that’s why Hunter invited pandemonium when he kicked off the medley (which closed the show prior to the encore). “This is where we get off,” he said. “So I know it’s a seated audience and all that, but if you feel free, do whatever the f*** you want.” Many of us took this as a signal to bolt for the stage, and the band, by then nice and loose, had a rocking, rolling, on-its-feet crowd for the final nearly 40 minutes of the show. For a smidgen of context, here’s a shot from an appearance on British television in 1973 or ’74. Fisher wasn’t officially in the band yet — don’t forget, his face isn’t even in the young lady’s Afro on the “Hoople” cover — but this one frame captures all three musicians. The same three cats who played the Keswick! I’ve gotta say, lotsa watchable, listenable videos resulted from the gig. The clips below — presented in chronological order — are by Steve Easton except for “Marionette,” which is by Velodrum1 (in two parts). Dig it!